The Watford City Police Department recently welcomed a new and much-needed addition to its department, and has already been utilizing the K-9 unit to fight Watford City’s crime. For the first time in a long time, officers have a K-9 available to assist in their law enforcement efforts to better serve and protect the city. 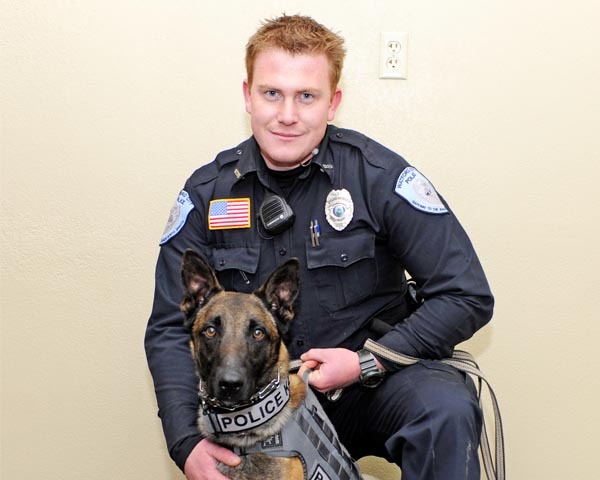 Officer Ryan Chaffee was promoted from within the department to his new position with the K-9 unit in the beginning of January. Chaffee joined the K-9 dog, Pido, in Kansas and together they spent the month of January training and getting certified. According to Art Walgren, Watford City Police Department chief of police, training typically consists of everything from building searches to obedience training to certain ‘sniffs.’ There is extensive training to get certified and it is very rare that the dogs don’t successfully pass the training. Training also includes the legal aspects with a K-9, such as the K-9 behavior and psychology. According to Walgren, areas they will be working on with their specific K-9 unit in Watford City include working on proofing the dog on money, tracking people, and article searches. The new K-9 unit was requested through the oil-impact grant, which paid for the dog, the vehicle, the equipment, and the training. The grant did not pay for the officer, however. The officer position will be funded through the police department. The grant will end at the end of this month. Pido, the K-9 dog, came from a Germany-based company called K-9 Working Dogs International, which works with 18 kennels across Germany. The K-9 dog is trained for the first one to two years of its life at those kennels. After that training is completed, the dogs are then imported to the United States. They are initially trained on knowing obedience commands, handler protection, and to bite on command. Essentially, all the basics and testing are done there, before coming to the U.S. The company’s goal is to find dogs with a high sense of smell and then to start the training and testing process. Once the dogs are imported to the U.S., they spend several weeks with a company here to get certified in drug odors. The four main drugs the dogs certify in, according to Walgren, include marijuana, cocaine, methamphetamine, and heroin. Once a dog is trained and certified on both patrol functions and drug detection, they are considered a dual-purpose dog. As a K-9 unit, the officer and the dog are constantly together. The dog even lives with the officer. According to Walgren, the department has taken a lot of precautions when it comes to the safety of the K-9 dog. Within the patrol vehicle, there is an exhaust fan, a temperature monitoring system with a digital read-out for the officer, and alarm systems that will sound on the officer’s belt when it gets too hot. Because the K-9 dog is a police dog, he’s territorial and not to be considered a pet. One thing the K-9 officers do, according to Walgren, is not allow the K-9 dog to be around people that much. They don’t want the dog to become too friendly, as to not hinder its job as a K-9 dog. “Maybe in the summertime, when the dog and officer are more comfortable, we can possibly have some demonstrations for the public to view,” says Walgren. The K-9 dog will also be working with the school district in maybe doing some random searches of lockers, much like what has been done in the past. And since being added to the department in January, the K-9 unit has already been deployed on several different calls this year.